The Red Guard is Back! Well, sort of. I just hope Briek Schotte doesn't roll over in his grave! On Wednesday night, in the middle of yet another snowstorm, a group of middle aged American flahutes proved their stripes by ignoring the TV media's 'sky-is-falling' exhortations to stay off the roads, and instead gathering at BikeWorks in Swansea Mass. to share a Duvel toast and launch a new Masters racing team: Fast Eddy's Flandria Cafe - Bikeworks - Flandria. The original base layer. Where did it go? Without danger of exaggeration, I'd say these four ribbed, off-white, Italian wool t-shirts were the single best piece of cycling gear investment I ever made. Each one cost me less than $10 back in ...wait for it... 1980. That may have been wholesale, kinda forget now. They've outlasted my memory. No matter how hard I try, I just can't kill them. They get washed and washed and still look like they did when I bought them. They've been pummeled by washing machines, tortured in dryers - never been lucky enough to receive the manufacturer's recommended care. No worries though... still as comfortable and functional as the day they were first worn under a wool jersey. They bear surpisingly few scars from the wars. And they've seen plenty. One has a red-brown stain when some red Clement rim cement spilled on it... but that's about it. Time to zone out from today's late-breaking, interminable, and depressing 'did-he-or-didn't-he' doping news, and enjoy a few photos specially selected to match the local weather here today, and serve as a reminder of why we all love this sport. The pure spectacle of man against mountain, in adverse weather. A setting that strips away all the nonsense and leaves us with the bare essence. A man. A bike. Adversity. Acceptance. And a quote that - to me anyway - is a pretty relevant response to today's headlines and associated spin. Particularly to those of us who might be asking the obvious question, "tell me why should I believe in this sport again?" "I would like to give you something more permanent, but I can only point the way. I have no formula for winning the race. Everyone runs in her own way, or his own way. So, today I'm driving home from work. First I'm almost taken out at 70 mph on I-95 by some dip-sh** 20-something girl texting on her cell phone while driving. Flippin' idiot. Then, 10 minutes later, I turn slowly in the dark onto my snow-covered quiet street, and a local 16-year-old girl steps out in front of me without looking, her downcast eyes glued to a 4-inch mobile phone screen which is also plugged into her ears. Good thing I'm one alert crusty old flahute with fully operational sprinter reflexes and not just your average dip-sh*** 20-something texting while driving! Kid never had any idea how close she came to getting flattened. I shudder to think of it. I swear, the whole friggin' world has lost it's collective ability to function for 5 minutes without looking at a tiny screen or getting input from a digital device of some sort: Fast Eddy's introductory metaphor and contextual platform for tonight's raging bulletin rant. 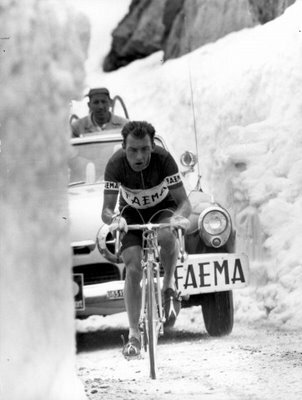 Another cycling legend - Peter Post - passed away in Amsterdam a few days ago after a long illness. 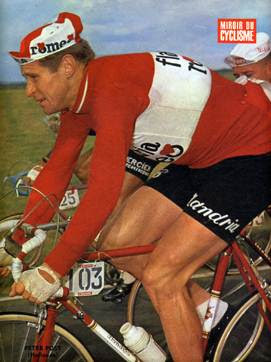 Post was the tall, definitive Dutch hardman: King of the winter six-day track in the sixties, winner of Paris Roubaix 1964 for this cafe's beloved Flandria team, and perhaps best known as director and manager of the Raleigh and Panasonic juggernauts of the 70's/80's/90's. I was surprised to see so many of the news site obituaries just posting the bare, basic facts about his career. Little context about the man. Surprising because there was so much more to the legend of Peter Post than a list of race results and accomplishments. There's a great video overview of his career here. And a documentary on the reign of Post's ('Post train') teams here. 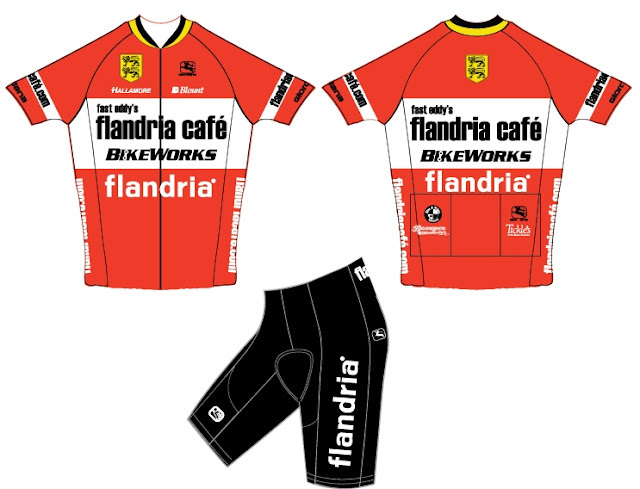 Hey cafesupporters... unveiling the Flandria Cafe team issue bike for 2011. I'll take this over Schleck's Trek anyday. The red guard is back. Built it up over the weekend. Tested on trainer, fits glove-perfect. Flandria Competition carbon frame, 51cm. Belgian design. Was psyched to find out that this racefietsen is just under 2 lbs. lighter than my old carbon Bianchi. That with Campy record (alloy cranks) and clincher Campy Neutron wheels. Schweeet. Kudo's to Adam Longworth and our friends at Flandria bikes for the perfect modern interpretation adaptation of a classic wielericon. Can't wait till the the snow's gone and can get it out on the roads. Got about a foot or so of snow yesterday. These days it seems like a 'normal' snowfall like yesterday's is enough to virtually shut down the state. When I was a kid, there's no way a storm like this would have caused the same general sense of emergency. We're getting soft. Every time snow is forecast, you'd think the blizzard of '78 was coming again. The great unwashed loading their giant SUV's with milk, bread and ice melt. Silly. We should implement a mandatory 'winter term in Montreal', like national service. Forced recalibration for the overcoddled. 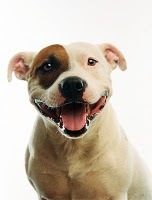 Coincidentally yesterday, one of our cafesupporters, CCB's own 'Mike the Russian' sent me this, his signature photo: The perfect visual antidote to storm cancellations, politicians spinning their 'we're prepared for any conditions' sound bites, and the TV news media's incessant late breaking storm updates. They all should just shut up and ski. Jeez, I feel like I'm at an Irish wake this week. Another grand old man of cycling was sadly lost to wielerfanatics over the weekend. Emile Masson Jr., the Belgian winner of the 1939 Paris Roubaix passed away Sunday. He was 95. 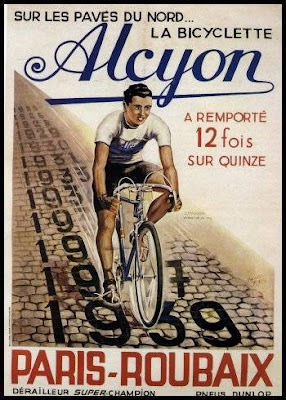 Masson was the son of a professional cyclist who followed in his father's footsteps. Both had careers interrupted by wars: Emile Sr. the Great War, Emile Jr. WWII which saw him spend 4 years in a German prisoner of war camp. Both rode great Tours de France, Emile Jr. notably winning a stage in the 1938 race won by Gino Bartali. Somewhat melancholy new year cafesupporters. Raymond Impanis passed away yesterday at 85, after a bout of pneumonia. The champion nicknamed the 'Baker of Berg' was, along with Rik van Steenbergen and Briek Schotte, Belgiums great hope in the years just after World War II ended. What's that? Never heard of him? Well, you should know about him, for he was important, one of the last survivors of what was cycling's 'greatest generation'. Impanis life story provides a better lesson to all who swing a leg over a saddle than almost anything you'll read in a cycling magazine this year. Let me put his importance in context for you.